I wasn’t going to run this. I had thought I’d be enjoying the sights in London. Plans changed. I’d had a long hard week at work – felt really wiped out. By Friday evening, I wanted to just lie in bed for a couple of days and unwind. 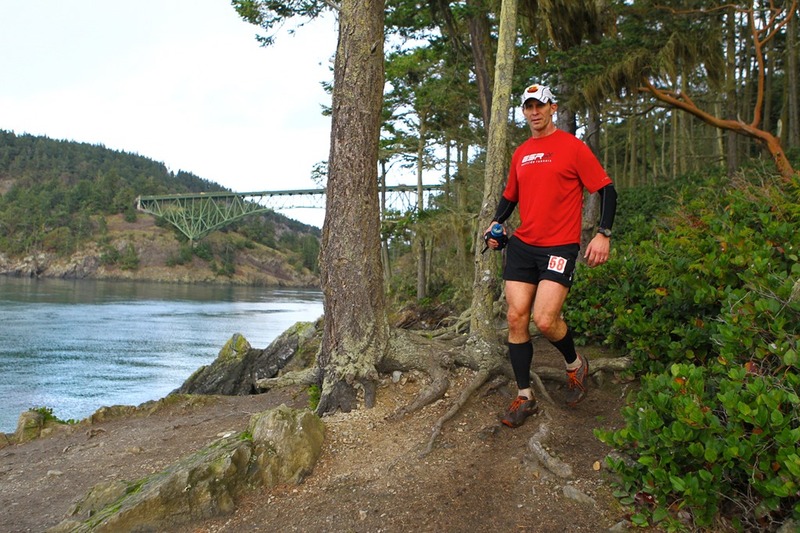 I decided to relax and do a nice long run up at beautiful Deception Pass State Park. It might seem counterintuitive, but running is a great way to calm yourself down. You just have be in the moment, and keep moving. It’s great. By the time the alarm went off early Sunday, I felt just recharged enough try it. It was a quiet, dark drive – not many cars on the road. I’d driven past the park, but had never stopped. It’s a beautiful place – haunting. I’d arrived later than I’d planned, and just had enough time to drop my bag, get my number, find my happy place, and then rush to the start. We set out just after 8am, right as the sun came up. As we climbed, we skirted the edges of the cliffs several hundred feet above the Sound. I don’t love heights, but there was no way to avert my eyes from the stark beauty along the water. Crossing the bridge was wild. We ran along a 3 foot wide shoulder between the steady traffic, and the long drop to the water. No wind, just the sound of the cars and my breath. Once on the other side, we darted off the road and began doing a series of “lollipops” – loops that took us by Canoe Pass, Lighthouse Point, and then out to Bowman Bay. We would wind through the woods, and then find ourselves along a steep cliff by the water. Wow. 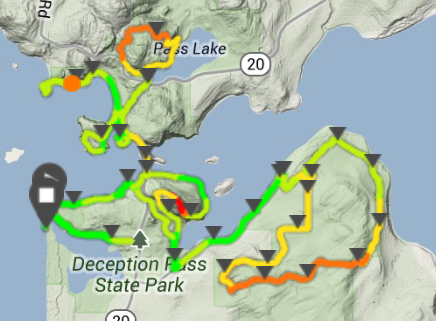 After circling around the Pass Lake lollipop (five of seven of them), we headed back across the bridge. by now we were a third of the way to the finish. My legs were tired, but I felt okay. We headed east towards Cornet Bay, and then hit the road again. 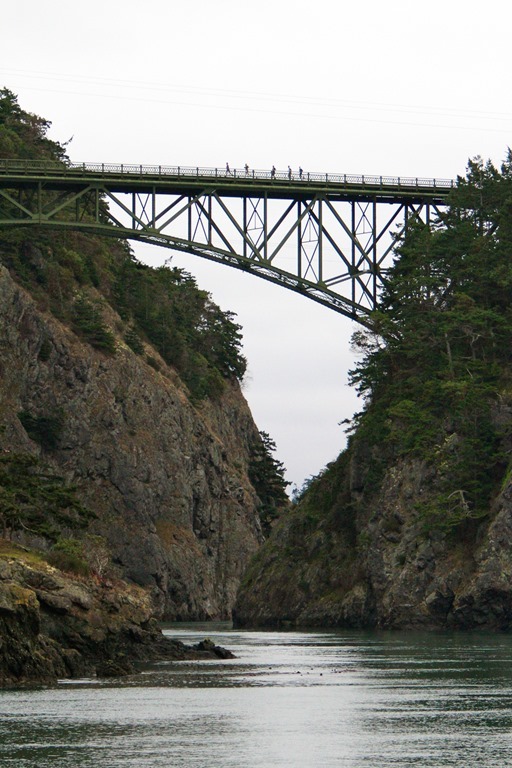 As we ran along the road, I looked back over to my left and could see some runners coming up along the cliffs on the approach to the bridge I’d just crossed. Seeing the small moving bodies climbing the trail across the water was striking. Right around mile 14, we came to an aid station where I learned we’d see them twice more, because we’d do the same loop twice (I really should study the course a bit ahead of time). I settled into a steady pace as we headed up a dirt road, turned sharp right about 0.3 miles later, and then commenced climbing. When we leveled off. I settled into a faster pace than I probably should have. But it felt good just to air it out a bit. The second time around the loop was slower – apparently I’d taken that first trip a bit fast. By the time we came back through the aid station for the final time, we’d completed about 28 miles. I ate a bunch, and then started the cruise to the finish. All you have to do is just keep moving. The hardest part of any race is getting to the starting line. Straight column, lean forward, and glide. You just have to keep moving. Simple. After a nice up and down stretch through the woods, with some nice paths along the cliffs, I came into the finish. I’ve had faster days, and some slower days too. But today was all about relaxing, and enjoying the time. I sat down, enjoyed some fine music, ate a bit, and reflected. 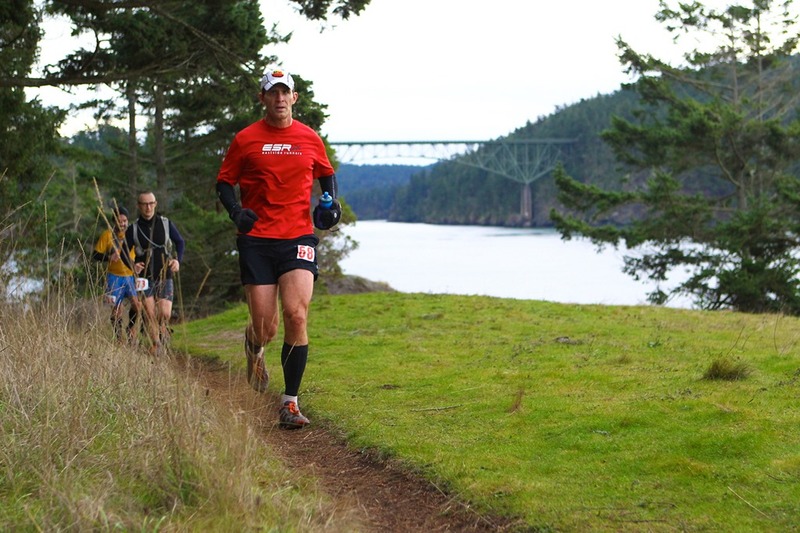 Check out the beautiful photos Glenn took at this race. Buy some too – let’s keep him in business, he does such fine work. 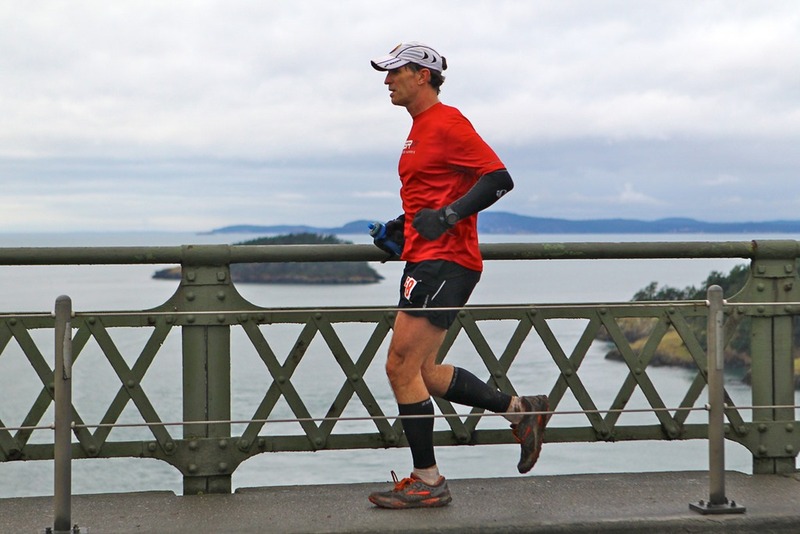 Big shout out to Rainshadow Running for making a hard week much nicer. Not sure why I do split charts for trail runs. Owing to the hills, you can’t really compare the times. The upward trend in pace illustrates that perhaps I could have paced a bit better, but so what? And here’s the elevation chart for comparison. There was a total ascent on the course of about 4000 feet. The heart rate chart shows some interesting spikes. Not sure I believe them.